Partnering with coastal communities in support of Oregon’s vital seafood industry brings Professor Gil Sylvia in close contact with fishermen and other stakeholders. Gilbert “Gil” Sylvia spent childhood summers riding a bus through the lake-studded military base where he lived, hauling buckets of live fish from pond to pond. He and his buddies were trying to alter the balance of species for one reason: to boost their own catches. They never guessed that by dumping sunfish, bass and catfish into the Army’s carefully managed trout ponds, they were making a mess of fisheries management. The clean-up cost thousands, he learned later. “I’m still trying to make up for it,” laughs Sylvia, a professor of Agricultural and Resource Economics at Oregon State University. Today, he has decades of experience in science and economics to back up his efforts. As superintendent of OSU’s Coastal Oregon Marine Experiment Station (COMES) — the largest such station in the United States — Sylvia oversees research and outreach in ocean resource science, management, policy and marketing. 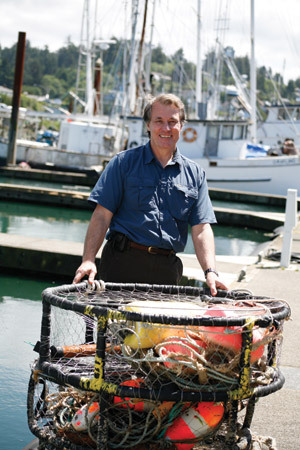 Along with 20 faculty and staff members and several dozen graduate students located at the Hatfield Marine Science Center and the Astoria Seafood Laboratory, his collaborators include the Oregon Seafood Commodity Commissions, the Community Seafood Initiative and various industry groups, as well as state and federal agencies. Key research areas include aquaculture, fisheries science, fishery management, fishery ecology, marine mammals, marine economics and marketing, marine fisheries genetics, and seafood science and engineering. According to the Oregon Invests database, COMES programs generated more than $12 million in economic impacts in 2008 and 2009 and produced an equivalent of 30 to 40 new jobs for Oregon and Pacific Northwest coastal communities. Terra writer Lee Sherman recently sat down with Sylvia in his Newport office to get an overview of COMES and its impact on Oregon coastal economies and communities. Terra: What defines the marine experiment station? Sylvia: The station is unique because it’s highly interdisciplinary. We have many disciplines, from seafood marketing to technology to ecology to genetics, economics, aquaculture, all in the same group. And therefore, we can really tackle things. When we sit down with communities, we’ve got all the different perspectives. I think it’s a huge advantage. Terra: What’s the key to bringing the university and the fishing community together? Sylvia: The key is trust. They have to trust you to be honest and objective, not to have agendas. Terra: How do you develop that trust? Sylvia: We create a table for scientific discussion and ideas, get people to talk about those ideas, brainstorm them, and put a teams together that aren’t just traditional scientists — teams that include members of the community, the industry — to tackle the problem or seize the opportunity. I don’t think it’s well understood just how tough our fishery laws are, how many challenging goals have been set into law, particularly over the last decade, for managing and conserving every single stock of fish. For example, at any given time there may be 50 salmon stocks found off the Oregon coast. There are at least 60 stocks in the ground-fish fishery. So you are managing hundreds of species and stocks. Each one has to be conserved at a level equal to or above a stock level that maximizes biological yield. Without really good science, we won’t be able to do it successfully because the challenges are so difficult. You have to bring everyone to the table to figure this out. Terra: Did we learn things during the spotted owl wars in the ‘80s that are helping inform the current discussion about marine reserves? Sylvia: Clearly, the terrestrial wars — in terms of using space, creating corridors and linkages, and conserving biodiversity on the landscape — are having a great deal of influence on thinking about the design of the reserves. The linkages may not be exactly the same because you’re dealing with a three-dimensional environment in the ocean. But the idea is that one area may be a good spawning ground, another area may be the settlement ground. You’re trying to accommodate the different life histories and connect them spatially. We’re moving through a new era of spatial management in the oceans. Thirty years ago the fishing industry could go just about wherever they wanted to go, fish where they wanted to go. Today, if I drew you a fishing map of the ocean and showed you all the rules about spatial use, just for fishing, you’d have a hard time reading the map. Now you’ve got marine reserves, wave energy, wind energy. And so you have traditional uses clashing with new uses just like in the terrestrial landscape. In some ways it’s not that different. Terra: Aquaculture is another potential user of ocean space. Sylvia: Yes, but not at the same rate. That’s because offshore aquaculture is really quite difficult to do, particularly in our dynamic environment on the West Coast. But we’re just about at the limits of what we can generate from ocean resources. The world, collectively, might be able to produce another 30 percent with really smart management of fishing resources. But it’s still going to be capped by the natural productivity of the oceans. So the only way to get more seafood is from aquaculture. But how do you accommodate aquaculture, given concerns about space, disease transfer or effluent? All those things have to be considered and thought about to accommodate it in smart ways. Terra: Where does Oregon stand on offshore aquaculture? Sylvia: Oregon has been particularly sensitive about offshore aquaculture. The federal government made an effort to develop enabling legislation to support offshore aquaculture about five years ago. But I don’t think the National Marine Fisheries Service really went around and had conversations with a lot of the states. So the states’ reactions, and Oregon’s in particular, was, “Is this going to have a negative influence on our oceans, our fishing industry?” Politics and peoples’ visceral reactions got ahead of it. The Legislature wrote a statement saying that they were very concerned about offshore aquaculture in their state waters and basically took an anti-aquaculture position. Terra: What was OSU’s stance? Sylvia: In response to that, the leadership right here at the Marine Experiment Station, Chris Langdon in particular, pulled together an offshore aquaculture conference to try to get an honest discussion going about all the views and to bring experts from around the United States to the table. We had about a 130 people participate right here at the Hatfield Marine Science Center. It was an excellent conference. We had offshore aquaculturists, many of whom are former commercial fishermen, talking face-to-face with Oregon fishermen. My own view is, if you want to build on your fishery industry, your seafood industry, you have to consider aquaculture. But you also have to think about impacts. “Zero impacts” is a big value today. But you can’t use the ocean without some impact. The question is, what’s the standard? Is it zero impacts or reasonable impacts? What are reasonable tradeoffs between the different uses in the ocean? How do we measure those impacts and tradeoffs? At what point do they become damaging? I think the university has a very big job in leading those debates and bringing people to the table, having an open, honest conversation, hitting all the issues, and searching for solutions. Terra: As a marine economist, a lot of what you do is “bioeconomic modeling”? What is it? Sylvia: The bioeconomic model merges two types of models — biological models and economic models. Biological models help us understand species or ecosystem behavior. Economic models try to replicate our economy, maybe on a micro level, maybe on a macro level, and try to figure out what happens if people behave a certain way in response to various rules, constraints and incentives. What happens to prices? Supplies? Jobs? In fisheries, it’s both the biological species and man’s behavior interacting. How do humans impact the resource? If we fish hard today, what happens to the biological population tomorrow? It’s a very powerful tool for exploring how you optimally manage. You can’t figure out fishery or aquaculture management without doing bioeconomic modeling. Terra: How do isotopic signatures of salmon help us manage the fishery? Sylvia: Jessica Miller on our faculty is a national expert in this area, looking at the ear bones of fish, which contain chemical “signatures” in the form of isotopic ratios. Those signatures, those minerals that are laid down as ratios, will tell you the animal’s age and where it’s been—its life history. How long did a salmon smolt stay in a river? Did it leave early or late? That may be very important when you have dams releasing water. Did it go into the ocean too early? Did it do well there? Or did it die there because it was flushed out of the system too early or too late? Where did it go in the ocean? We’re also using the ear bone to do to a project in the Columbia River, going through Indian middens to try to track the history of salmon. Terra: Do those isotopic signatures help with salmon management issues now? Sylvia: Yes, exactly. We’re trying to connect life history with salmon behavior and management of watersheds and fisheries. How can we use that knowledge in good management? Terra: What is the status of your pilot project tracking local fish origins with bar codes? Sylvia: We developed a Web tool called Pacific Fish Tracks, which we used for marketing seafood, including salmon and albacore. A consumer at New Seasons markets, which specialize in high-quality local foods, could go in and pick up a piece of fish, scan a bar code, and view a video clip telling the story of the fish product he or she was buying — the story of the fisherman who caught it, where it was caught, who processed it. We’re hoping to have some meetings this winter with New Seasons about the next stage. They’d like to brand four or five products with Pacific Fish Tracks labels. And we’ve continued to build it out. We’re talking with at least three other fisheries on the Atlantic Coast, in the Gulf, and in British Columbia. We’re hoping to do projects not just in Oregon and on the West Coast, but around the United States, using this tool. Terra: The concept sounds similar to Country Natural Beef, where ranchers go into stores to show consumers where the meat comes from — trying to connect the grower to the product. Sylvia: Exactly. Tools like Fish Tracks help build the sustainability story. People want to know the food they’re eating is safe, high-quality, sustainable and, in many cases, local. Our concept, our vision is that the fisherman, the manager, the scientist, the retailer, the consumer are all part of the greater seafood community. And we’re trying to connect them all through portals on the website. So while we’re using rigorous science and objective information, we’re also trying to convey information and connect people. I think it’s a good example of how you really tackle ecosystem-based approaches to science and management and involve the community. I’m hoping one day we’ll have a K-12 portal for high school teachers, too. Terra: Pacific whiting was your first big success as superintendent. Sylvia: I hadn’t been here more than a week when a fisherman came up to me and said, “Oh, you’re that new guy that was hired by the university.” We started talking, had a couple of beers. And then he goes: “You know, I’ve got to tell you something. You’re here for one reason and one reason only: whiting.” And I said, “What’s a whiting?” I spent the next 10, 12 years of my life on it. Probably half of my work was just Pacific whiting, every part of it, from quality to marketing to bioeconomic modeling. It’s now Oregon’s largest fishery, by volume. It’s used to make a variety of seafood products, including surimi — a fish product that can mimic crab legs or other seafood products. In fact, one of our faculty, Jae Park, is an international leader in surimi research and education. That is exactly the kind of project we can conduct in Oregon, with industry, state and university partners all together at the table: intelligent discussions, smart approaches and, well, here we are. Are other coastal states and universities getting involved in similar projects? I’m in Key West, where we have issues with lobster ( which are really huge crawfish). Overfishing as well as poaching contribute to a declining population. The commercial lobster industry is dying. Interestingly, the once-common Grouper have been wiped out in the fishing zones, but in protected areas such as the Dry Tortugas Marine Sanctuary, they grow into enormous, 600 pound giants!